Have you ever questioned where hope lives? When the news of the tragic Paris massacre began to come across the wire and the full details of the darkness that transpired began to unravel I began to again question where hope lives. It is the same questioning that flooded my soul following the attacks against our nation on September 11th of 2001 that again reminded us of the shadow of darkness that looms over us. The same searching that takes place every time I hear of another atrocity overseas. The Boston massacre. The San Bernardino shootings. Abortion. Homelessness. We are continually confronted with stories of hopelessness. Hopelessness presses in on all of us personally too. Death can rock our worlds. Employment issues and finances can leave us crippled. Broken relationships can leave us at our knees. There are times when we are all left to ask where does hope live. While serving in New York City I was reminded of where hope lives. I met hope on a park bench in Tompkins Square Park in the East Village. His name is José. Day in and day out José wakes up to the raw reality that his ‘home‘ is nothing more than a few planks of wood stretched across an iron frame in the middle of the park. Day after day he wakes up and watches the world pass him by. No security. No assurance. No safety net. No idea what tomorrow holds. José didn’t always call this bench home, but eventually the circumstances of life brought him to this place. No hope. Or so one would think. José may surprise you though. Every day he makes the decision to wake up with a thankful and grateful heart. José has come to a deep and fulfilling understanding that who he is is not the sum of what he does or does not have. José has come to embrace the truth that this world is not his home. José daily lives the reality that as a child of the living God the apparent hopelessness all around him doesn’t dictate his worth, his thankfulness, his passion or his joy. José told me his only need is the one thing that the world can’t give him and the one thing the world can’t take from him, Jesus. 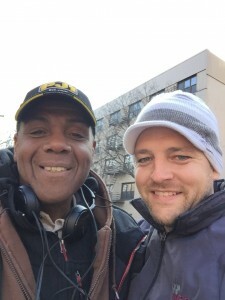 Because of that hope, to José, Tompkins Square Park is a mission field. His mission field. One in which he gets to serve his neighbors, rich and poor, testifying and proclaiming God’s goodness right where he lives. Hope wasn’t just living in Tompkins Square Park but hope was also serving meals and dignity in an unassuming building nestled between Rivington Street and Stanton Street on Bowery. With a Brooklyn drawl and an endearing, contagious spirit hope’s name was Chef Rocco. A butcher by trade, Rocco finds himself with ‘more than enough’ and could certainly rest and enjoy the rewards of his labor. 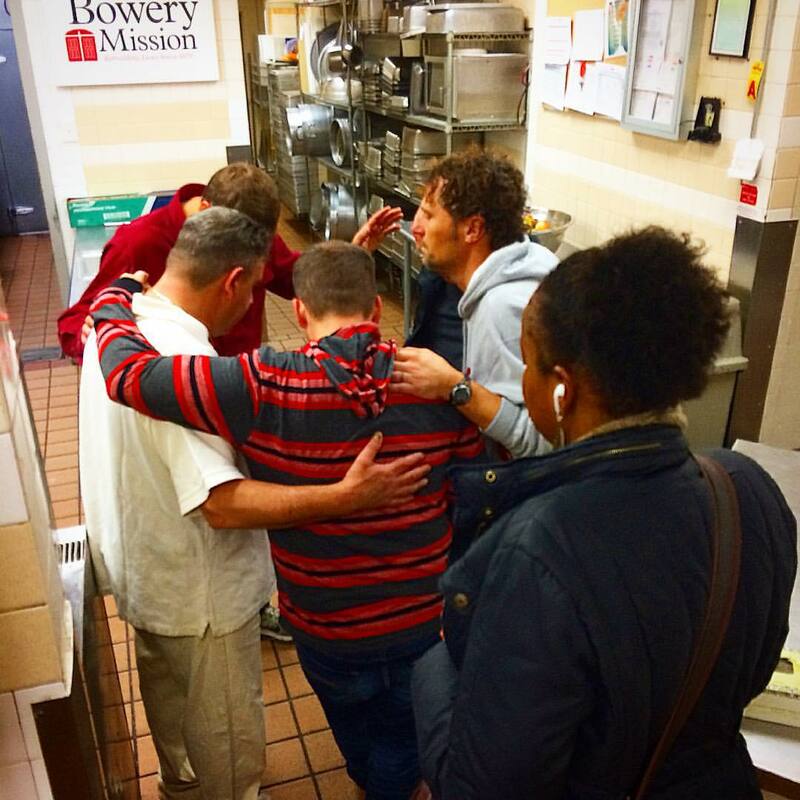 Yet Rocco gets up at 3:00am every day to head to The Bowery, to prepare the kitchen to serve those who wouldn’t have a meal otherwise. Rocco discovered the same thing that José discovered, his life was not his own, but merely a conduit by which God’s goodness could spill onto others. Rocco is giving of himself to those who could never repay him. I know where hope lives because I saw it all over the streets of New York City. I saw it on the face of those with little more than the clothes on their backs and those with millions of dollars in the bank. 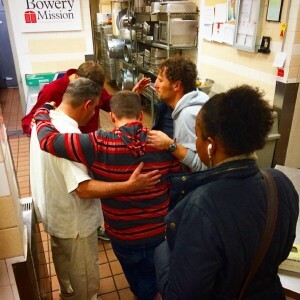 I saw it in the eyes of families who didn’t know where there next meal would come from as they sat around tables while we served them an ‘all you can eat Spaghetti dinner’ in the East Village through ‘The Father’s Heart Ministries’. They are daily reminding families that Daddy’s not angry, you can come on home. I saw heard it on the lips of those in the Bronx who waited hours just to get a fresh pair of socks, toiletries…and prayer from The Relief Bus. I experienced it firsthand as I watched countless people completely giving their lives away in service to others. As the chaos and darkness of this world continues to press us from every side I will always remember my friends in New York City and how they reminded me where hope lives. Hope lives in the middle of the extravagant and unfailing love of God for us through His son Jesus Christ. Both in abundance and in nothing, in turmoil and in peace, we have the assurance that this is not our home. May we not only rest in and experience the only true source of hope we all have; but may we allow that hope to spill out onto every individual we meet. This broken world is not our home; and our God is more than enough as we navigate through it. Hope. Joy. Peace. They are all for us, for today!